You will be blown away! 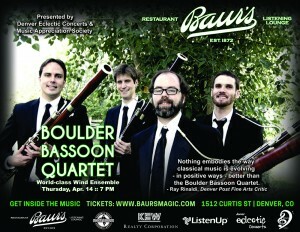 Clever, rare, and eclectic, the Boulder Bassoon Quartet is bringing its unique chamber music program to Baur’s Salon in downtown Denver. Performing selections ranging from the Beatles to Bach, Jazz and Pop to Classical, as well as specially requested arrangements – Denver Eclectic Concerts and Music Appreciation Society present a unique night of woodwinds featuring the bassoon! 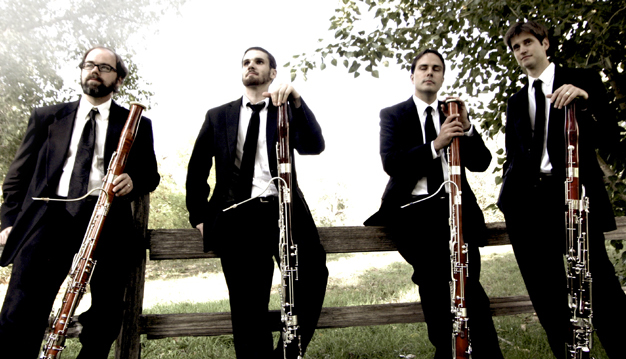 The Boulder Bassoon Quartet has impressed a wide audience around the world with engaging performances since 2006. 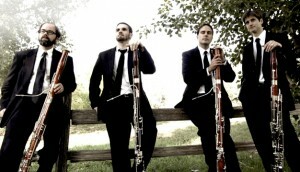 Having performed in diverse Colorado venues from the Governor’s Mansion to the Stanley Hotel to the Pearl Street Mall, the Quartet — Michael Christoph, Kent Hurd, Brian Jack and Ethan Turner — is dedicated to expanding the repertoire for bassoon quartet in a variety of genres through new arrangements and original compositions. In 2011, they premiered Kent Hurd’s new piece, “So Cliche,” at the International Double Reed Society convention in Tempe, Arizona. Recently, the Quartet has undertaken an ambitious project resulting in new works by award-winning composers, world premieres, community outreach, a debut album, and a tour to Tokyo in August 2015. Michael Christoph has been the Instructor of Bassoon at Metropolitan State University of Denver since 2010, teaching bassoon as well as music theory labs and music appreciation. As a performer, he is building a reputation for his rich, dark tone and heartfelt musicianship. He is a dedicated chamber musician and has enjoyed a variety of collaborations in Arizona and Colorado and serves as bassoonist of the Metro Faculty Woodwind Consort. He co-founded and organized the Among Friends mixed-media chamber music series in Boulder, and he was a founding member of the Elision Wind Quintet of Tucson, AZ. Kent Hurd has enjoyed a variety of experiences as a bassoonist, performing in the metro area of Phoenix, Arizona, and more recently in the Front Range of Colorado. He is currently Co-Principal Bassoon of the Boulder Chamber Orchestra. Other appearances in the Front Range of Colorado include the Colorado Ballet Orchestra, the MahlerFest Orchestra, the Denver Philharmonic and the Longmont Symphony. He held the position of Co-Principal Bassoon with the West Valley Symphony in Phoenix until moving to Colorado in 2003. He also participated in a variety of freelance opportunities in Phoenix, including appearances with such orchestras as the Phoenix Symphony and the Arizona Opera, as well as with a variety of chamber ensembles for concerts, holidays and weddings. Brian Jack is a bassoonist, educator, and music administrator living in Boulder, Colorado. He is a member of Colorado Ballet Orchestra and has performed with ensembles such as the Colorado Music Festival, Colorado Symphony, and Colorado Springs Philharmonic. In 2013, he was a Guest Artist at the Fairbanks Summer Arts Festival in Alaska where he performed opera, ballet, symphonic works, chamber works, and the world premieres of new pieces. Ethan Turner is a freelance bassoonist in his home state of Colorado. He began playing saxophone at age 11, bassoon at age 14, and has performed professionally in the Denver Metro area since age 17. Ethan began studying with Dr. Yoshiyuki Ishikawa at the University of Colorado, where he later obtained his degree in Bassoon Performance. As a young musician, he played principal in the prestigious Denver Young Artists Orchestras. He has toured Austria and Hungary under the baton of Adam Flatt, currently the conductor of Colorado Ballet, Tuscaloosa Symphony, the Newport Symphony in Oregon, and the Curtis Summerfest. 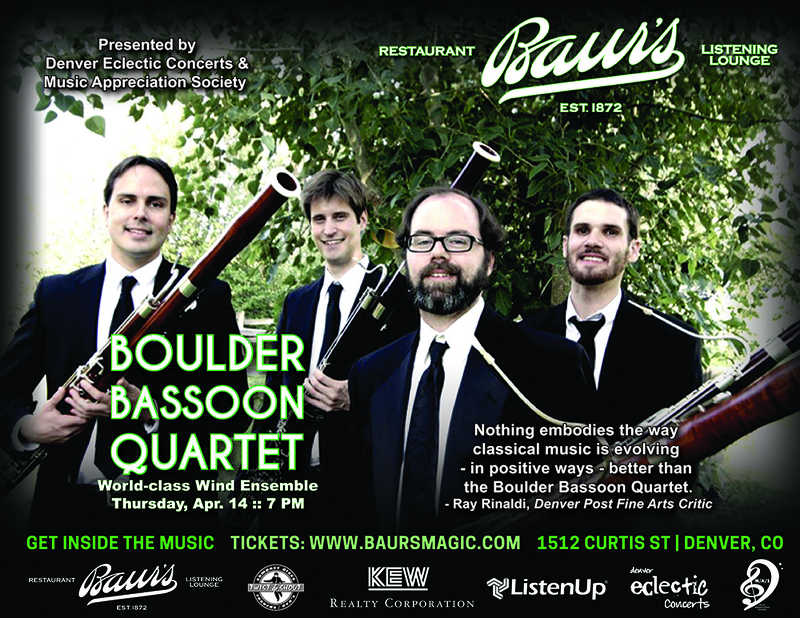 Denver Eclectic Concerts and Music Appreciation Society invite you, your family and friends to be blown away by the experience of the Boulder Bassoon Quartet’s first appearance at Baur’s in the acoustically superior Salon on Thursday evening April 14.